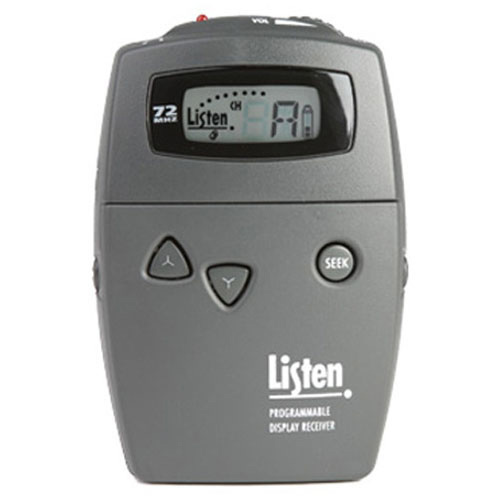 The Listen Tech Portable Programmable Display RF Receiver (72 MHz) is one of Listen's most sophisticated receivers, the LR-500 Programmable Display Receiver offers the signature Look&ListenTM LCD Display that shows programming status, channel, lock, battery level, and RF signal strength. Channel selector buttons are easily accessible on the front of the unit. It has channel SEEK capability and is compatible with mono or stereo headsets. It takes AA batteries (alkaline or NiMH rechargeable). SmartChargeTM capabilities prevent overcharging. It's easy to use, easy to program.